Open the folder with the latest version of .NET (4.x) and from there, open the Config folder. Open the machine.config file within the Config folder. Note: you might want to back up this file before changing it by using File -> Save As... to save the file with another name such as machine.config_broken, etc. Search for the text "<system.data>" in that file using Edit -> Find. Once you've located that text, delete the single line reading "<DbProviderFactories/>" and then save the file. (For 64-bit systems only) Repeat this process with the C:\Windows\Microsoft.NET\Framework64 directory. If you've uninstalled Paprika, you can now reinstall it. Launch the app. 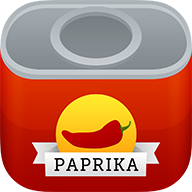 Paprika should now be able to initialize the database. Note that uninstalling and reinstalling Paprika should not be required to fix this error, however you will need to quit and relaunch the app if it is open while you make these changes. If you'd like more information about how/why this corruption may have occurred, here's a related StackOverflow post. This solution should fix the problem for future third-party database-driven apps.